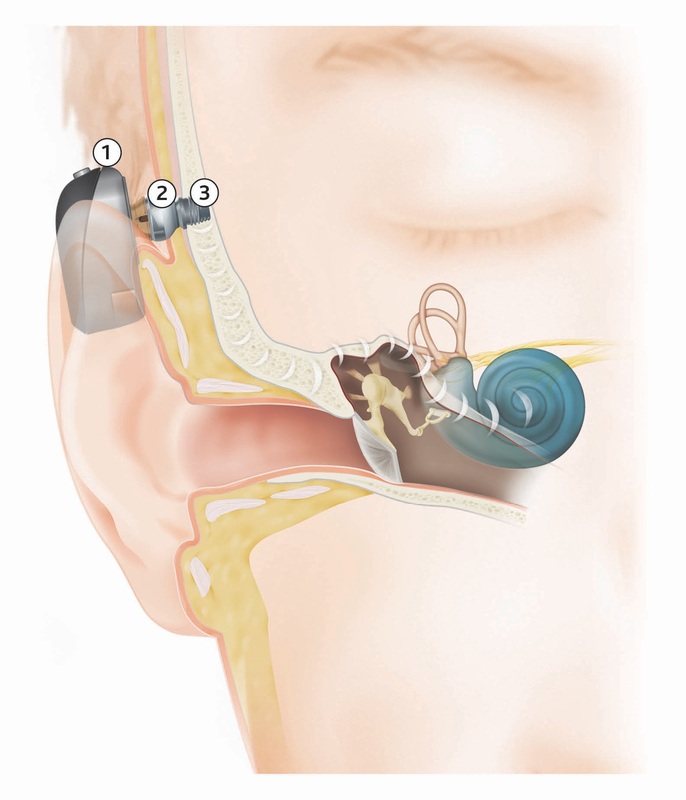 Conventional hearing aids capture and amplify sound in the outer ear, which is transferred to the middle ear, inner ear and ultimately the brain where it is interpreted and understood. For people with untreatable outer or middle ear problems, however, conventional hearing aids may not be sufficient. Bone Conduction Implants (also known as Bone Anchored Hearing Aids) enhance the body’s natural process of conducting sound directly to the inner ear via the bone of the skull, effectively bypassing the outer and middle ear. By boosting this natural process, people with untreatable outer or middle ear problems, but a functioning inner ear, can hear sounds clearer and more crisply than ever before. The device is also suitable in some cases of single sided deafness. The external processor captures soundwaves in the air. The processor then turns the sound into vibrations and sends them through the abutment or magnetic connection to the small implant. The implant then transmits the vibrations through the bone directly to the inner ear. The inner ear then uses it’s natural process of turning vibrations into nerve impulses which are sent to and interpreted by the brain as sound. There are a number of types of Bone Conduction Implants with differing configurations, design and even colours. The device that is suitable for you will depend on the specific attributes of your hearing loss. A full diagnostic hearing test is undertaken by Mackay Hearing’s experienced Audiologist to determine the type and extent of hearing loss and your potential candidacy for a Bone Conduction Implant will be discussed. If you are a candidate, a trial of a temporary (soft band) device will be arranged. If the trial is a success, a referral to an Ear, Nose and Throat (ENT) Specialist will be issued. The ENT Specialist will consider whether you are medically suitable for the device and, if so, surgically insert the implant and abutment or magnetic connection. Once the ENT Specialist has given clearance that the surgery area has adequately healed, Mackay Hearing’s Audiologist will fit and program the external sound processor. Ongoing troubleshooting, maintenance and support will be provided by Mackay Hearing’s Audiologist. If you would like any more information on Bone Conduction Implants, please contact our friendly local staff directly on (07) 4952 4649 or email us at listening@mackayhearing.com.au.